A Champion for Change is anyone who tells the story of our community, whether that be through volunteering, investing or advocating. 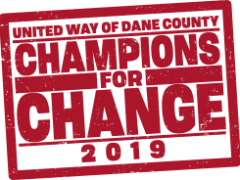 Share the link to these videos to help explain United Way’s role in the community as told by these #champions4change, our partners. Share these images on Social Media! United Way of Dane County’s mission is to unite the community to achieve measurable results and change lives. They are committed to the vision of a Dane County where everyone can succeed in school, work and life. To facilitate this, they follow our community’s Agenda for Change, six goals focused on three priority areas of Education, Income and Health – the building blocks of a stable life. 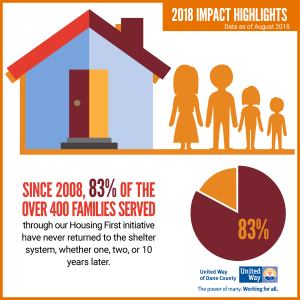 United Way works with just over 100 partner agencies (over 55 receive volunteer-led investments) to support proven programs that help stabilize families. United Way is led by nearly 1,000 volunteers working across more than 60 committees. These 1,000 volunteers work to raise every dollar, count every cent, spend every penny, measure every outcome, engage thousands more through volunteerism and education and advocate far and wide to make sure this community can be its best self. United Way believes that when we work together our community is stronger, healthier and more successful. United Way of Dane County takes on, in partnership, the complexity of the challenges in our community at their root cause. 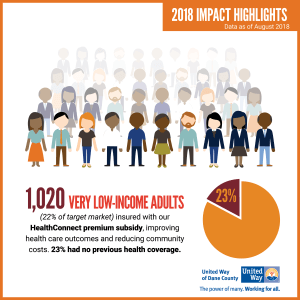 United Way engages the many voices across the community in tacking these challenges with sustainable, high quality, cost-effective and measurable solutions. United Way is a community convener, increasing the capacity of all partners in change. United Way is for Dane County, by Dane County; We invite everyone to be a part of the change. United Way proudly invests 86% of all dollars raised in programs and initiatives right here in Dane County. 14% of all dollars raised are dedicated to running a strong, transparent organization, engaging more businesses and individuals to strengthen our community. For the eighth consecutive year, United Way has earned Charity Navigator’s 4-star rating. Only 3% of the charities evaluated by Charity Navigator have received at least 8 consective 4-star evaluations; indicating that United Way of Dane County outperforms most other charities in America. United Way has the platinum GuideStar seal of transparency. The platinum seal is the highest level of recognition offered by GuideStar, an international online database of information about charities that advances transparency, enables users to make better decisions, and encourages charitable giving. United Way is a strong believer in cross-system collaboration. By working across the areas of education, income and health, your dollars will go further and results will go farther. United Way is called upon by the community to convene diverse stakeholders around our community’s toughest issues. Skilled facilitators use data-driven analytics to help the community define and understand the scope and scale of issues, to understand local lived experience and points of view, research evidence-based practices, identify common ground, articulate collaborative action and hold stakeholders accountable to achieve desired change. Nothing will ensure the continuity of our programs or the ability to expand our programs like sustained giving. If you are interested in investing in specific programs or in the Agenda for Change as a whole – please give online or at your workplace. Participate in one of our year-round Seasons of Caring opportunities, consider becoming a Schools of Hope tutor, or reach out to United Way to design and execute your company’s team building volunteer event. Why is United Way changing its investment process? We want to build toward a Dane County where contact with any program offers connection into a system of holistic family support. The research-based and community-informed strategies of the Agenda for Change help families in Dane County achieve their education, health and financial goals. But, we also know from research, families, and agency partners, that families have complex needs that are not always served by one agency or program. While agencies are already collaborating with each other, they often are not given funds or dedicated time and space to strengthen these collaborations to work collectively together on large-scale initiatives that will reduce the number of families experiencing poverty. This new investment category will allow for us to support those initiatives. In the end, cross-system work will build on family strengths as nonprofits work in partnership to empower families to manage financial setbacks and build their economic security. I only have a second – can you sum it up? Underemployment, homelessness, school readiness, and health – these things are all related. 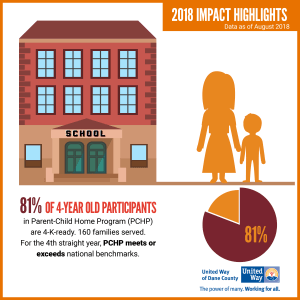 United Way understands that reducing poverty in Dane County can only be done through collaboration across multiple programs targeting each of these areas – a holistic approach to family stability. We’re changing how we invest to make our dollars go farther and our results go further. If you want to support this innovation, give to United Way so that we an achieve a Dane County where everyone can succeed in school, work and life. • What is your personal “Why” for giving back/being involved? • What has United Way meant to you/your organization? • What hopes do you have for the Dane County of the future? • What is the one thing we need to focus on to get there?